There are many ways to fold notes, and this project will show you how to create one that has been popular for years. The pull tab note creates a small envelope that keeps your secret message safe inside. The recipient can quickly open it with the tab. 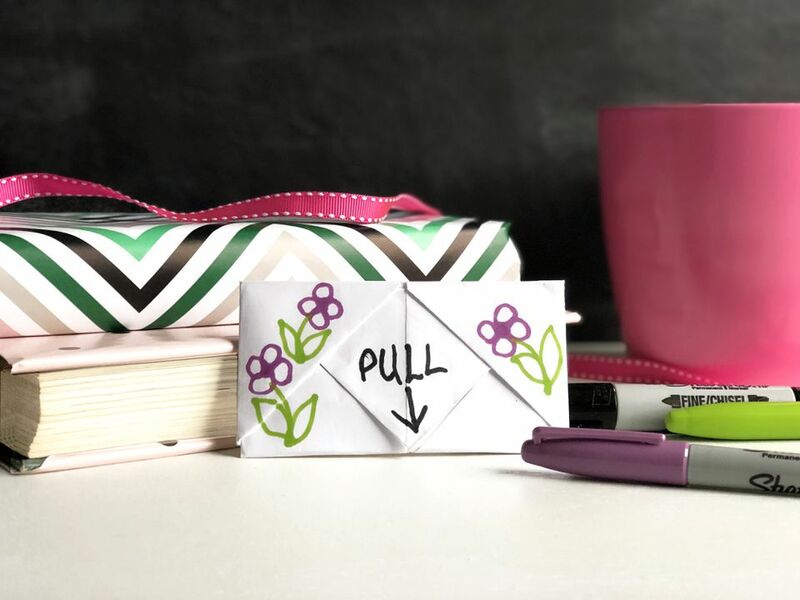 Not only is this a fun, old-school way to send someone a note or letter, but it's also a quick and simple introduction to origami as well. It's best to practice making the pull tab note on a blank piece of paper. Afterward, you can unfold it to write your letter, then fold it back up. It ensures that you don't waste paper or time if it doesn't come out as you expected. Once you become more familiar with the folds, you can write your note first, then fold the paper. Start with a blank 8 1/2- x 11-inch sheet of paper. This example shows white copy paper, but you can use colorful copy paper, lined notebook paper, or even graph paper. Just make sure it is standard letter size. If it isn't, you can trim it. Fold the paper in half horizontally, sharpen the crease with a bone folder or your fingernail, then open and lay flat. Turn your paper horizontally. Fold the top right corner toward the center, then fold the bottom right corner towards the center. Your folding project should have two equal triangles with a vertical line down the center. Fold the top left corner towards the center fold, then fold the bottom left corner towards the centerfold.This step should create four equal triangles with a vertical line down the center. When you fold the corners, align the edges of your folds, so the two triangles on each side line up evenly. There shouldn't be a gap between the edges of your folds. Fold the straight top down toward the center and the straight bottom up toward the center. Everything should line up along the center fold of the paper. Flip your paper over so that the folds are facing down. The flat side of the paper should be facing up. Take the left edge of the paper and fold the paper toward the center of the paper, about one-third of the way. The tip of the triangle that appears on the left side should line up with the left edge of the paper. Taking the right edge of the paper, fold it toward the center as well. Now the left and right edges of the paper that you just folded should overlap in the center of the paper. Tuck the top right and bottom right corners into the left and right pockets. Take the corners of the right fold (which should be on top) and tuck them into the folds on the left side. Tucking the corners will keep your note securely folded until the tab is pulled. Flatten your pull tab note. Your pull tab is in the center of the note. You can label it with the word "pull" or draw a fun arrow. You can unfold the note and write your note and then refold it. Flip the finished note to write your "to" and "from" message or draw doodle images to decorate your note before giving the note to someone special. Now that you have made your first origami note, you may have been bitten by the folding bug. Try these other types of origami folds offered on The Spruce Crafts. Any of these cute paper shapes would make a delightful note to pass on to your friends.